The Summer Solstice Celebration has been a thriving Santa Barbara tradition for 44 years, thanks to people like you. This tremendous public expression of our town’s highly individual creative spirit needs your help this year more than ever. The Thomas Fire and recent mudslides have had significant ripple effects on the local Santa economy. Our nonprofit organization is struggling with the impact of these disasters because Summer Solstice represents a huge cross-section of our community. IF YOU ENJOY THE UNIQUE ANNUAL TRADITION OF THE SUMMER SOLSTICE PARADE, YOU’LL WANT TO KEEP IT HAND-CRAFTED, LOGO FREE, AND WILDLY ARTISTIC. Together, all of us make the heart of Santa Barbara and also the heart of Solstice. YOU have all made the 44 years of Solstice so special and memorable! Take a moment to contribute. Your $1-$5 donation will allow us to preserve the Solstice tradition this year. It will also help us reach our goal of becoming an arts incubator and international festival for the region, and allow us to look forward to another 44 fabulously creative years! Our fundraising goal is $200,000. Our creative staff, volunteers, vendors, partners and service providers have already had one of the most stressful years on record. It is imperative that we have the resources necssary to support the hardworking people and local businesses who make the celebration possible. Right now, it’s vital to support the Summer Solstice Celebration. Each year over 100,000 attend the parade and 3-day celebration and support the economic vitality of the region. Your timely contribution will make a huge difference to restore Santa Barbara’s economic health as a prosperous, dynamic and creative home and destination. Please take a moment now to donate to ensure a successful 2018. About the Solstice Workshop, Parade and Festival. The Solstice workshop is where our community comes together to create floats and ensembles for the parade! The workshop is located at the Community Arts Workshop at 631 Garden Street and opens May 1st. Hours are 3-8 PM Wednesday to Friday and 12-6 PM Saturday and Sunday and almost every day and hour in June! Experienced Solstice artistic staff members are on hand to help the entire community build the creations of their dreams highlighted each year in the parade and festival. The Solstice Festival is June 22-24, 2018 at Alameda Park. Solstice Parade begins June 23, 2018 at noon at State & Cota and ends at Alameda Park. The Solstice Children's parade is Sunday, June 24 @ 1 PM at Alameda Park along with a full day of family fun until 6 PM. We need your help to make it all possible! Summer Solstice Celebration's mission is to bring the community together through the arts! - promotes culture, arts and economy in our region. Summer Solstice Celebration was featured at the Santa Barbara International Film Festival. If you have never been to the Summer Solstice workshop and want to see it up close, check out this short documentary presented at the 2018 Santa Barbara Film Festival by Justin Gunn. Yes, you fabulous, wild-haired friends and friends of the wild hairs... we love each and every one of you! Summer Solstice Parade began in 1974, as a birthday celebration for a popular Santa Barbara artist and mime named Michael Gonzales. 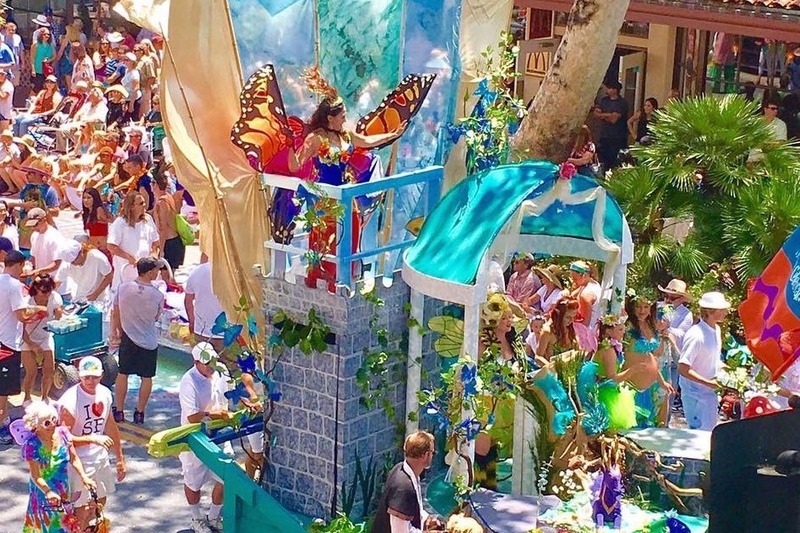 In subsequent years, the parade joined forces with a Summer Solstice Music Festival coordinated by Michael Felcher, sponsored by The Santa Barbara Museum of Art, staged at the Sunken Gardens to celebrate the longest day of year. Early in its history, the Summer Solstice Celebration had minimal costs, but our expenses have grown along with the expansion of the festival. Featuring unbelievable floats, giant puppets and whimsical costumes for nearly 1,000 parade participants, the Summer Solstice Celebration has evolved into a fantastic display of creativity and originality. Today, over 100,000 locals and visitors alike visit Santa Barbara's Summer Solstice Celebration for the workshop, parade, 3 day festival and year-round programming. Your donation of even $1 makes a difference. Each year we mostly depend on the 3-day Solstice festival and individual donations to raise funds to support all the activities that make Solstice possible. We also seek sponsors and apply for grants, but this year more than ever, individual donations are crucial. Summer Solstice Celebration's year-round budget averages $258,000! Due to the unprecedented disasters and the economic impact to our community, our ability to raise the required funding has been severely impacted. With your support, we will have the opportunity to ensure we have the necessary funds for the workshop and our artists. Additional funds brought in as part of the parade and festival will allow us to plan for 2019. We are so grateful to YOU and our many sponsors who have supported us in keeping this treasured Santa Barbara tradition alive. For more information contact Robin Elander, Executive Director via this site's direct message or visit www.solsticeparade.com to get involved! Help us preserve one of Santa Barbara's favorite artistic traditions for years to come by making a donation today.